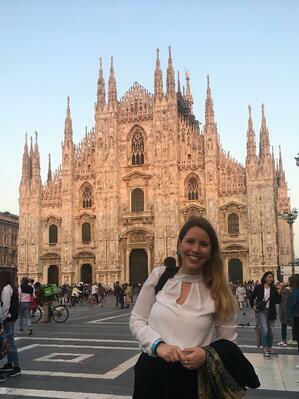 As our Inside Sales Specialist for Southern Europe, Elisabeth Ste-Marie is persistent, empathetic, and fueled by new discoveries—consistently raising the bar and getting involved. A speaker of four languages, she loves traveling to immerse herself in new cultures and meet interesting people. She’s always seeking enriching experiences to add to her repertoire of stories! After completing my Master’s degree in International Management in France, I spent some time in Buenos Aires working for the Argentine-Canadian Chamber of Commerce. I was just returning to Canada when I chanced across an opening at Robotiq. I knew I wanted a job that would allow me to stay close to my family yet also travel whenever wanderlust strikes. In addition, I’ve always enjoyed working in fast-paced environments, and knew I would love living in Quebec City. I immediately knew Robotiq was the place for me! I identify strongly with Robotiq’s values of respect, positivity, creativity, practicality, teamwork, and family spirit. Robotiq team members inspire one another to embody our aspirations, both on and off the job. I work closely with our partners and customers daily to make their projects as clear and simple as possible. It’s important to do this with a human touch to give the the client the best experience we can; “yes” is the word I want to hear, and “happy” is the feeling I want you to have when we work together. I feel honored to help our partners and customers chase their goals; it’s so empowering to work with a wide range of partners who I genuinely love chatting to and meeting with every day. We are the infinite team (name of Team 8 at the RUC2018 Technical Challenge)! As an added bonus, I have amazing colleagues—always ready for a beer, poutine, or a coffee. They even changed my tire for me one day when my bike had a flat! I am curious by nature, so continuous learning is very important for me. I am fascinated by how technology affects our daily lives, and I want to contribute to other people’s success. I also believe strongly in our mission at Robotiq: to free human hands from tedious tasks. Because human contact is a priority for me, I love learning new languages: it lets me get to know people I might not have otherwise. My mantra in life is you get what you give, which keeps me motivated and working hard. On a personal note, family is the most important thing to me. I especially love spending time with my brothers and nephew! 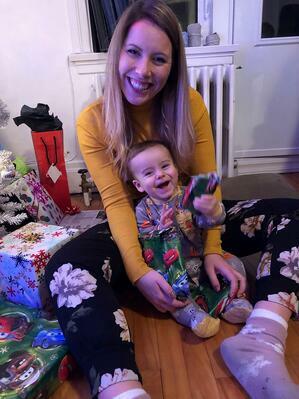 They bring me joy, and I want to do the same for them. I’m a traveler, an adventure seeker, always looking for new experiences. I love challenging myself to step beyond my comfort zone. Life is to be lived to the fullest! I embrace life by spending much of my time with my family, doing sports, or discovering something new. I’m constantly checking Google Flights and planning my next adventure. I always try to achieve something when I travel, like the physical challenge of the five-day trek to Machu Picchu in Peru, or skiing the Aiguille du Midi mountain in France. Next destination: Everest Base Camp in Nepal, perhaps? P.S. : Although family is my top priority, sometimes I think it’s actually food! As M.F.K. Fisher said, “First we eat, then we do everything else.” What can I say? I’m a foodie. 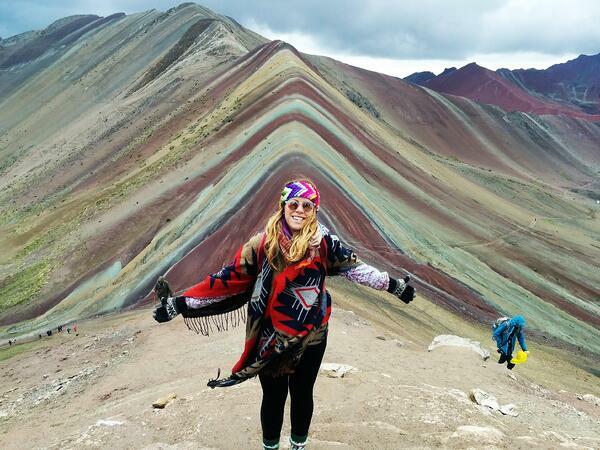 Elisabeth at Vinicunca, the Rainbow Mountain, in Peru. Elisabeth Ste-Marie is one awesome Robotiq teammates among many others. Want to meet them all ? Read more about Meet the Team !